If your business works at temporary jobsites that are humming with machinery—like a construction site or an oil rig— you’ll need a quiet place for employees to step indoors to manage paperwork and emails. Searching for a mobile field office space, you will likely find two options: office trailers and ground level offices (also known as a GLOs). What are the differences between these mobile office options, and how will they impact your business operations? We answer your questions below. Why aren’t office trailers considered ground level? While office trailers aren’t far from the ground, they do sit a few feet up on a chassis, a frame with wheels and a towing hitch. Ground level offices, on the other hand, sit directly on the ground. How are office trailers and ground level offices constructed? Both office trailers and ground level offices are constructed offsite in a manufacturing facility. There’s a fair amount of variability depending on the manufacturer and model, but office trailers often use steel and aluminum for framing and a combination of fiberglass, vinyl, aluminum, plywood, and other materials for the walls. Shipping containers have become the de facto base structure for ground level offices thanks to their inherent mobility and durability. A container-based office manufacturer will modify an ISO shipping container to have all the amenities of an office including doors, windows, electricity, plumbing and more. Thus, ground level offices usually have the steel framing and corrugated steel walls of the original conex container. Manufacturers will often finish out the office interior with plywood. How do I transport my mobile office? Office trailers are permanently mounted on a chassis, or a frame with wheels, and therefore towable by truck. Ground level offices need to be placed onsite by a crane, specialty forklift, or tilt bed truck. It’s possible to place a ground level office on a chassis. However, once the office is up on wheels, it’s no longer a ground level office, but rather a container-based office trailer. Most businesses choose to keep their container-based offices at ground level because the maintenance associated with the tires and chassis frame adds cost and inconvenience. What kind of site prep will my mobile office need? Office trailers and ground level offices both require flat, dry and level surfaces. Because an office trailer is on a chassis, you will need to spend some time blocking and leveling the frame. You may choose to cover the blocking and wheels with skirting to make the office look less like a trailer. Office trailers must also have OSHA compliant stairs from the ground to the doorway. Ground level offices, true to their name, sit directly on the ground, no stairs needed. 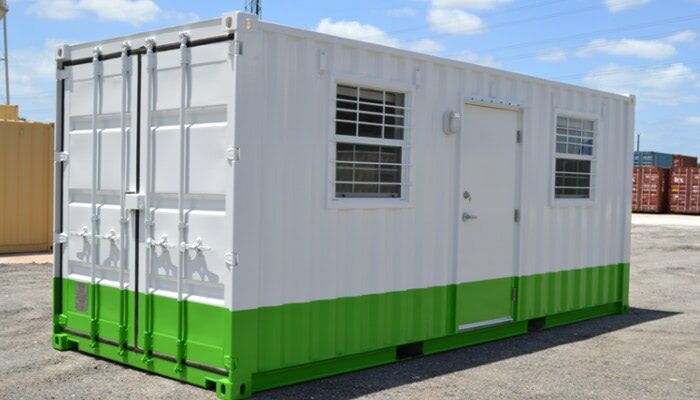 Depending on the site conditions, businesses often place their container-based offices without preparing a foundation. Permitting for mobile offices varies across localities. If you plan to use either solution, you’re going to need to talk to the local authority having jurisdiction about their specific process and requirements. When purchasing an office trailer, be mindful of the environmental conditions of the jobsite. For instance, you will have to select an office trailer that can handle the wind loads of the jobsite even if you purchase the trailer in a different region. Because shipping containers were designed to withstand storms on the high seas, ground level offices are sturdy enough for a broad range of weather conditions. If your ground level office will be subject to heavy snow loads, the ground level office manufacturer can take extra measures to ensure the structure is weather tight. Who uses ground level offices? Businesses that travel over rough, unpaved roads. The lifespan of an office trailer is directly related to how often it will be relocated and the quality of the roads it travels. For instance, if an office trailer is moved from the factory to a school campus and never moved again, the trailer might enjoy a long 20+ year lifespan. However, if a mining company frequently tows an office trailer over unpaved roads, significant and costly maintenance issues will crop up over time. Businesses that work in rugged environments choose shipping container-based ground level offices because the steel walls and frame can handle decades of bumpy transport with minimal maintenance. Businesses that need extra security. We won’t say it’s impossible to burglarize a shipping container-based office, but the steel walls and barred windows make breaking in extremely difficult. Construction companies were among the first to use shipping container-based storage and offices because the added security prevented theft at the jobsite. What options do I have for ground level offices? We know; they all look similar on the outside—rectangular, corrugated steel, a personnel door or two—but at Falcon we’ve created seven unique models of shipping container-based ground level offices. In our experience, businesses use container offices for three purposes: private office space, open conferencing space, and storage. To quickly find which ground level office best fits your needs, use our handy flowchart. If you have any other questions about container-based ground level offices, we’re always happy to answer your questions. Just give us a call at 877-704-0177.